Outbrain, one of the fastest growing content discovery platforms with more than 550 million users every month and over 100,000 participant websites has conducted a study to understand how content is consumed in the Asia-Pacific region. Based on their enormous database of 190 billion recommendations and 14 billion page views per month, their study throws some interesting insights into the pattern of content consumption in India and other Asian countries. 3 When Is Content Consumed? One of the biggest findings of this report is that desktop still rules the chart, when it comes to user’s engagement with content, especially paid content. As per Outbrain’s research, engagement level increases when a user accesses a particular content on desktop computer, compared to mobile or tablet. 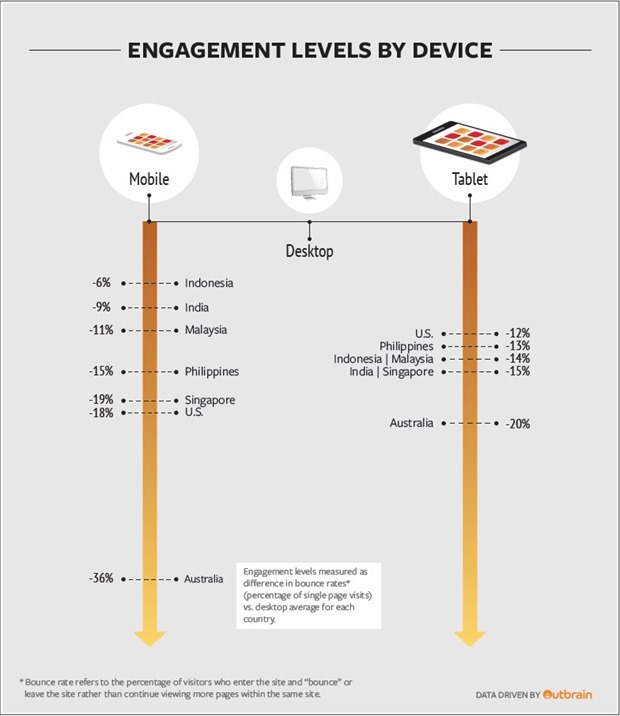 Infact, if we compare desktop vs mobile, then engagement level falls drastically to 36% in Australia; and 9% in India. This means that if Indian accesses a piece of content on mobile, then there is 9% less chance of his engagement compared to accessing content on desktop. Engagement here means sharing, commenting, liking the post or following the author/publication on social media. Interestingly, in US, this difference is 19%, for Singapore, it’s 18%. Similarly, for tablet vs desktop, the difference is 15% in India, 20% in Australia and 12% in USA. This finding actually debunks the theory propagated by Flipkart and Myntra regarding the usage of mobile apps for shopping. Imagine, in case a user drops his engagement plan with a piece of content, if he accesses the same on mobile or tablet, then how much difference it can make when it comes to shopping on a mobile app or desktop. As per Outbrain, the engagement level is more on desktop, because mobile or tablet is more of a ‘browsing user experience’; the user quickly reads or browses the content and moves forward. The action, mainly, commenting, sharing, or liking the post is mostly happening on desktop. Australia is the country where content engagement is the maximum, and Singapore is the least engaging country. Meanwhile India falls somewhere in between, with +0.4% engagement. If we observe topic wise, then content related with News, Sports, Business & Finance exhibited maximum engagement, while Technology, Internet, Health and Electronics content showcased least engagement. In India, the peak periods for hourly content consumption are 1PM and 2.30 PM; on desktops. 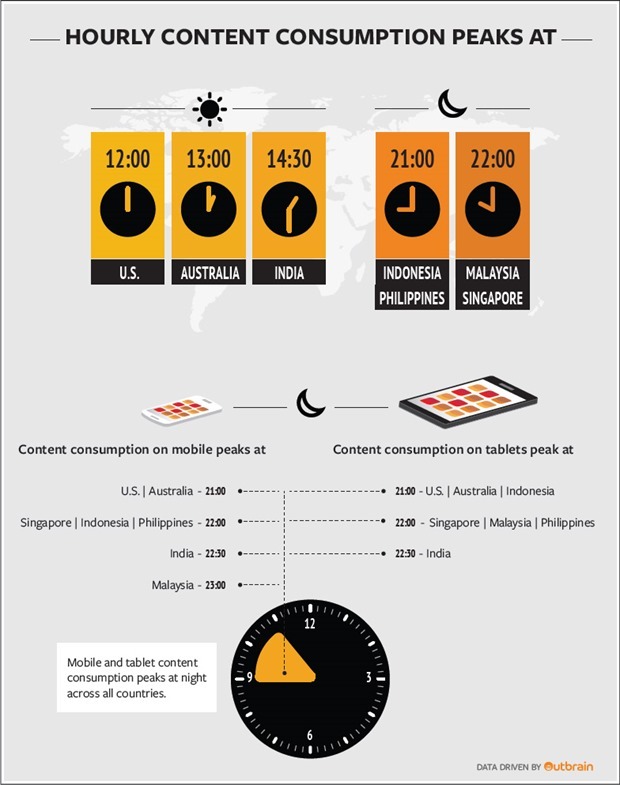 Between 9PM and 11PM, content consumption on mobile and tablets increase the most. For Philippines & Indonesia, it’s 9PM; for Singapore its 10 PM and USA its 12.00 PM noon. The common trend is that content consumption in mobile and tablets increases at night globally. 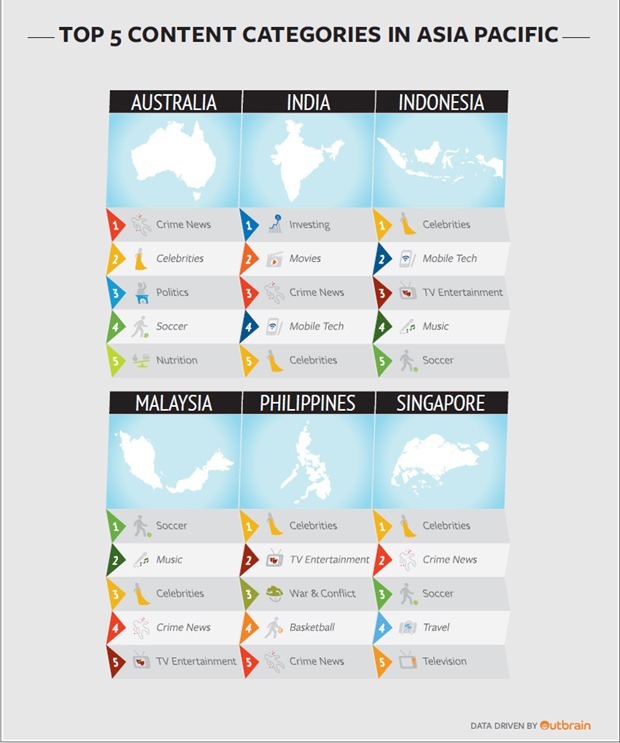 Another interesting aspect: which country consumes which type of content? When it comes to India, then Investing is the #1 content type preferred by readers, followed by Movies, Crime News, Mobile Tech and Celebrities. The survey was conducted for gauging content consumption in these countries: Australia, India, Indonesia, Philippines, Malaysia and Singapore.